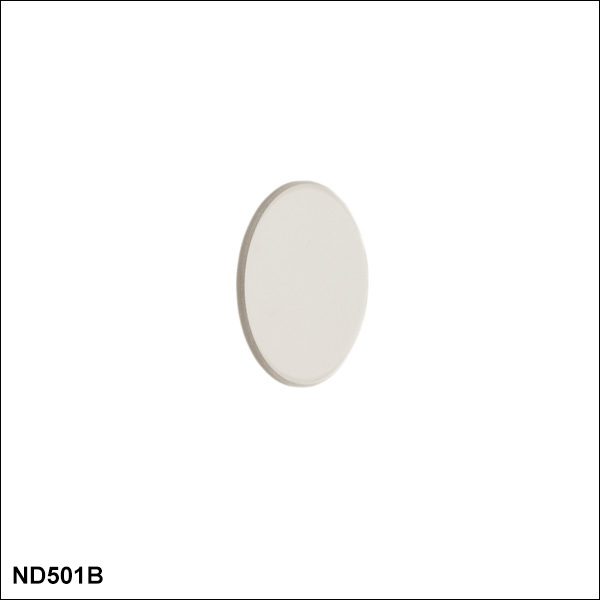 Thorlabs' Reflective Neutral Density (ND) Filters provide uniform attenuation over the broad spectral range from 350 to 1100 nm. 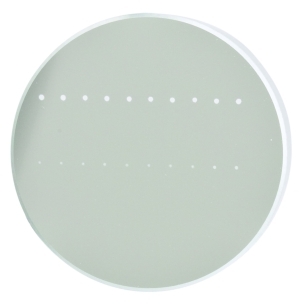 These metallic filters have optical densities ranging from 0.1 to 4.0; refer to the Specs tab above for detailed information about the average transmission obtained with each of our reflective neutral density filters. The Graphs tab contains plots of the transmission and reflection for each filter for a broad wavelength range. These filters consist of an N-BK7 glass substrate with a metal (Inconel) coating deposited on one side. Inconel is a metallic alloy that ensures flat spectral response from the UV to the near IR. Unprotected metal coatings like this should only be cleaned by blown air, never touched, as contact may cause scratching to the unprotected surface. 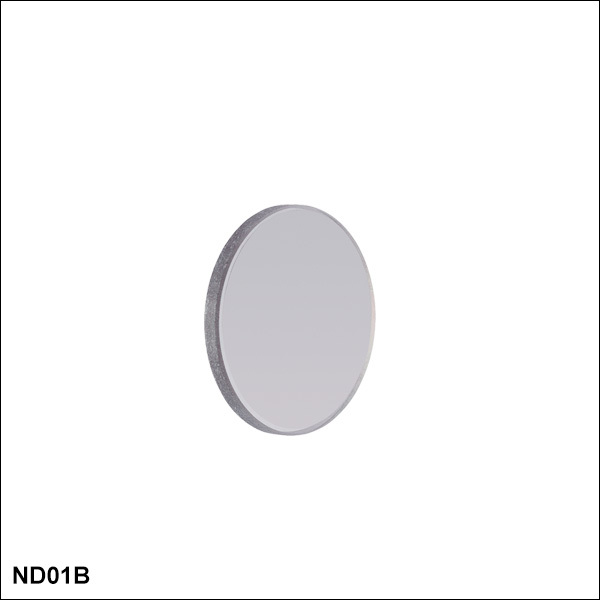 Although these are reflective ND filters, the Inconel coating does absorb some of the incident light, which limits the use of these filters to low-power applications. Inconel is resistant to aging under normal conditions; however, it will oxidize at elevated temperatures. 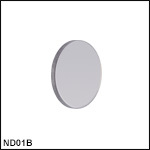 To prevent oxidation, Thorlabs recommends using these ND filters at temperatures below 100 °C. To achieve the best performance, light should be incident on the side with the Inconel coating. Our Ø1/2", Ø25 mm, and Ø50 mm N-BK7 reflective ND filters are also available mounted in SM05-, SM1-, or SM2-threaded lens tubes, respectively. Thorlabs also offers UV fused silica and variable reflective ND filters, as well as a complete line of absorptive ND filters in several sizes; the table to the right contains links to all of the available options. 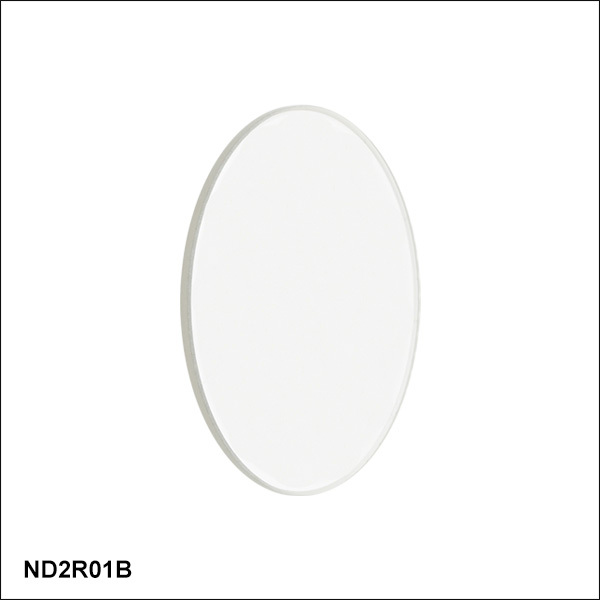 Choosing an ND filter with a higher optical density will translate to lower transmission and greater reflectance of the incident light. For higher transmission and less reflectance, a lower optical density would be appropriate. Please note that Thorlabs' Neutral Density filters are not designed as laser safety equipment. For lab safety, Thorlabs offers an extensive line of safety and blackout products, such as beam blocks, that significantly reduce exposure to the stray or reflected light. For individual transmission and optical density plots, as well as Excel files with raw data, click on this icon in the product tables below. An Excel file with transmission and reflectance data for all N-BK7 Reflective ND filters is also available. 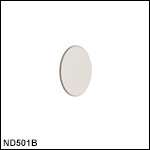 We present laboratory measurements on the difference in the etalon effect between our standard reflective neutral density (ND) filters and our wedged reflective ND filters. In many broadband scattering or absorption measurements, it is important to understand how intensity fluctuations through the utilized optics can impact the measurement. While it is known that parallel surfaces introduce significant wavelength-dependent intensity fluctuations, we find that utilizing a wedged geometry significantly reduces these etalon effects. For our experiment we used the SLS202 Stabilized Light Source as the broadband, fiber-coupled light source. The F260FC-C Fiber Collimator, held in the KAD11F Kinematic Pitch/Yaw Adapter, collimates the light out of the fiber. The collimated light is incident upon the ND filter that is being investigated before entering the OSA203B Optical Spectrum Analyzer. The OSA has a spectral resolution of 7.5 GHz (0.25 cm-1) and the traces were averaged (>100 scans) in order to reduce noise and allow for more accurate analysis. The data focused on a wavelength range of 1820 - 1845 nm, which covers the NIR water spectrum. 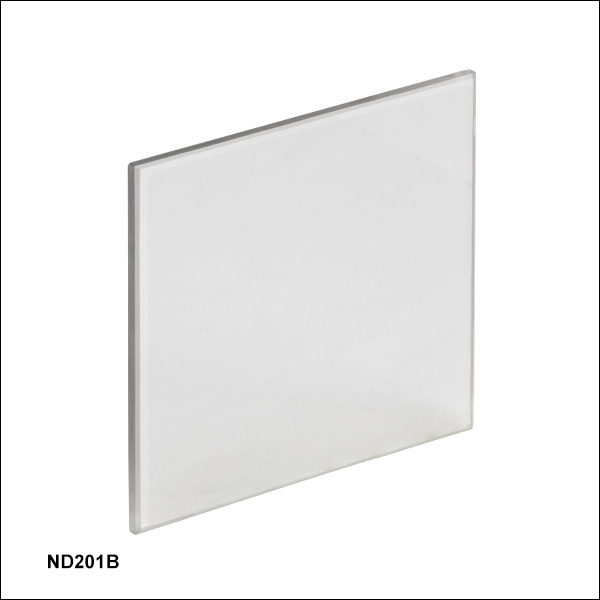 Since the absorption spectrum of water is well known, it is ideal to use as a comparison to evaluate the performance difference between these two styles of ND filter. The figure to the right summarizes the measured results for etalon effects through reflective neutral density filters. The etalon effects are quite stark, and we can see in the case of the standard ND filters that details of the water spectrum are lost to the intensity fluctuations of the background levels. By contrast, the wedged ND filters have a relatively clean signal with well-defined peaks. 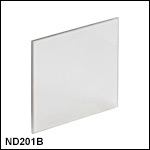 Data is presented for unmounted standard and wedged ND filters, though the results hold for mounted filters as well. Data is also compared to the HITRAN water spectrum standard. For details on the experimental setup employed and the results summarized here, please click here. The specifications to the right are measured data for Thorlabs' reflective neutral density filters. Damage threshold specifications are constant for a given optical density coating, regardless of the size of the filter. Hi, I have an ND530B filter and I would like to know if this filter preserve the polarization effect ? Hello, thank you for contacting Thorlabs. While we do not have any specific polarization test data on this, the metal Inconel coating will likely introduce some polarization effects on your incident beam. It's not designed to be polarization-maintaining, so a small change in polarization is to be expected. Hello, thank you for contacting Thorlabs. The tolerance for OD is ±5% at the design wavelength of 633nm. I will reach out to you about typical data, but unfortunately, we do not have any statistical analysis on historical variations. We are able to offer individualized testing at other wavelengths, however. Hi, I have an ND10B filter which I can see is a bit dirty. I read that you recommend only to clean it with air but this didnt work. I therefore wanted to hear if you have any other recomendations or will eg methanol just make it worse? Hello, thank you for contacting Thorlabs. Unfortunately, I would not recommend cleaning with any solvents as unprotected coatings are easily damaged by contact. I will reach out to you directly. Hi Dave, thank you for contacting Thorlabs. The tolerance we use for inspection is ±5% of the OD at the design wavelength (633nm in this case). I will contact you directly with typical data on the OD over the operating range. Response from Bweh at Thorlabs. The laser input should be to the face with the metal (inconel) coating. Do you have data for the transmission for s- and p-polarized light? Response from Tim at Thorlabs: Thanks for your comment. These were measured at 0deg AOI for transmission, but if you’d like to see S&P data with some angle of incidence, we can provide further data. I don’t see that you left any contact info, so please let us know if you’d like to go over this further at Techsupport@thorlabs.com. Response from Jeremy at Thorlabs: The data on the graph is typical at that range and should be used as a guideline value. We could provide the filter specifically tested at 850nm if needed. We will get in contact with you to discuss about this. Response from Tim at Thorlabs to Ryan: Thank you for contacting us. We have reflectivity data past 1100nm on the “Graphs” tab and I will contact you directly to provide typical plots on %T extended past 1100nm. Response from Tim at Thorlabs: Thank you for your interest in our Reflective ND Filters. We are able to quote many custom optics and I will contact you directly to get more information so that we may provide pricing and lead time. 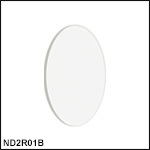 N-BK7 Reflective Neutral Density Filters We are interested in this product. But we need the size to be 180 mm x 180 mm. Can thorlab customize for us? What will be the piece price (10 pieces for example)? Thanks!